I am always recommending that you try new and different wines, from less common grapes or wine regions. You now have an easier way to try some wines from a lesser known area, Israel. A new, online wine store Israeli Wine Direct opens this month with a focus on hand-selected, artisanal, mostly non-kosher wines from Israel. Based in Chicago, Israeli Wine Direct stocks an inventory of top-rated wines, each hand-selected from Israeli wineries, and ships direct to customers in key states where allowed by law. Israel currently has over 150 wineries. Wineries represented within the Israeli Wine Direct selection are Margalit, Flam, Pelter, Meishar, Tzora, Yaffo, Bravdo, Somek, and La Terra Promessa, among others. Wines from Pelter Winery and Tzora Vineyards recently earned ratings of 90 points or higher. Israeli Wine Direct is also sponsoring a series of audio podcast interviews with leading Israeli winemakers and wine experts and hosting Israeli wine house parties across the U.S. Israeli Wine Direct is also partnered with leading Napa Valley wine marketing and Internet e-commerce firm Inertia Beverage Group. Israel Wine Direct even has their own blog. Here are some interesting facts about wine and Israel. ● Israel is located in the Eastern Mediterranean where wine culture was born thousands of years ago. ● After centuries of Muslim rule, winemaking was reestablished in what is today Israel by Baron Edmond de Rothschild and Sir Moses Montefiore in the late 19th Century. ● In the past 20 years, more than 100 small, artisan wineries have been established in Israel using modern techniques learned from experience in leading wine regions from around the world. ● A small handful of large commercial Israeli wineries account for 80% of the wine exported to the U.S. and are mostly kosher. ● The remaining 20% are made up of boutique "long tail" producers focused on making world-class wines that are mostly non-kosher. The D Street Café, located at 600 D Street in South Boston's Maritime Park, will officially open on July 3, 2008 and will an 80-seat outdoor restaurant serving fun, fresh, casual fare such as: grilled burgers, hot dogs, fresh sandwiches (including lobster rolls), salads and fresh local ice cream, as well as, “Grab-and Go” items. The restaurant will be a seasonal venture operating each year from: May - October and hours of operation will be: Monday – Wednesday, Friday, Saturday: 11:00am to 7:00pm, Thursday: 11:00am to 9:00pm. Extended hours on Thursday are set for special live music acts ranging from Jazz, Latin, Reggae and other world music. On the days that live music will not be featured a DJ from New York has been commissioned to prep a virtual soundtrack for daily operations. The South Boston Maritime Park sits at the center of Massport's extensive redevelopment area in the Commonwealth Flats district of South Boston. Massport goals for the park design were: to evoke the maritime ambience of the working harbor in concept, materials and execution; to create a "signature park" that would attract a mix of neighborhood residents, local employees and visitors to the waterfront; to create a contemporary public park would serve the day-to-day needs of the area as well as being a location for special / seasonal events. The overall objective of the park is to provide additional public green space along the waterfront that supports a range of activities that are inviting to a broad range of people. These include those working or living in the immediate area, and South Boston residents and visitors (Convention-goers, tourists, restaurant patrons, etc.). The programming and design of the park are focused on a maritime theme that celebrates both the heritage and contemporary activities of the Port of Boston. The park is located adjacent to and complements the existing Eastport Park. Over the weekend, I attended an annual summer party in Ipswich. Each year, we try to bring some unique cocktail, something different that we think everyone will enjoy. This year, we brought a large jug of St. Germain Cocktail. I first tried the St. Germain at a wine tasting in Saugus. I found it to be an intriguing liquer and I very much enjoyed the refreshing St. Germain cocktail. I thought it would make an excellent summer drink. This cocktail was a big hit at the party and they drank the jug dry. They loved its crisp and exotic taste. Plus, they thought it was a refreshing drink, with just a touch of sweetness. Even a few who hesitated at first to even try it, enjoyed it once they tasted it. We probably would have gone through a second jug if we had brought one. So, the next time you are attending a summer get together, why not bring some St. Germain cocktail and make a great impression on your friends and family. We all have heard that the picture of an animal on a wine label usually increases sales. There is some adequate evidence that that this has some validity. But why is that the case? Why would an animal, that usually have nothing to do with wine, help sell wine? In WineS Magazine (June/July 2008), there was a brief news article, "Wine Labels With Animals: Why they Work." It discussed a recent study in the Journal of Consumer Research (April 2008) that dealt with why adding animals to wine labels is an effective marketing technique. Commonly, a logo should be relevant to the product it is intended to represent. So, adding animals to wine labels seems to run counter to this common methodology. But, research has show that consumers have an easier time with an image if they are already primed about that image. This means that the consumer already has some preconceptions about the image from prior familiarity with that image. For example, if a person already likes dogs, then a picture of a dog on a wine label may appeal to that consumer, even if the dog has nothing to do with wine. The results of this study could probably apply to more than just animals on wine labels. It might explain about the popularity of some celebrity wines. It might also show why certain other wine labels are more popular than others, as some present a preimage to consumers that appeals to them. Just think how pink flowers on a wine label might turn off male consumers toward that wine. The article also mentions another advantage of animals, and other items, on wine labels as opposed to more traditional wine imagery such as grapes and vineyards. Animals and such are usually more unique labels, less forgettable than all those labels that have pictures of grapes. There may only be one winery using goats on their labels, but hundreds using grapes. The popularity of Saké in the U.S. continues to rise. This is evident by the growth of all-Saké stores. There are now three all-Saké shops in the U.S. First, there was True Sake in San Francisco. Now, there is also Sakaya in New York City (which I will be visting in a couple weeks) and Saké Nomi in Seattle. I only recently learned of Saké Nomi. Nomi is a Japanese word for "only" and is appropriate as the store sells "only" Saké. Now, when you put Nomi with the word Saké, it then roughly translates as "one who likes to drink." Saké Nomi is owned and operated by a husband and wife team Johnnie and Taiko Stroud. The store has been open for just over one year. They carry over 150 different Saké selections. But it is more than just a store to buy Saké, it is also has a bar. They usually have about 8-10 selections available for tasting and drinking. They also conduct monthly educational seminars and special tasting events. You can also sign up for their Nomidachi News, their email newsletter and keep up to date on upcoming events. I have not been to Saké Nomi but I still want to give it my support. I love Saké and want to see its popularity continue to spread. And these all-Saké stores are a great way to showcase the wonderful diversity of Saké. Plus, it gives an opportunity for newcomers to taste various Sakés, to find the style that they enjoy. If you are in the Seattle area, why not check it out. If you do, please come back and tell me about it. The winners in the 2008 Readers' Choice Awards have now been published in the June 25 issues of the local newspapers, including our own Stoneham Sun. You will also be able to read the list of winners online tommorrow. The areas covered by the awards include Stoneham, reading, Wakefield, Saugus, Melrose, Malden and Medford. There are over 70 categories though what is most important to me are the numerous restaurant and liquor store categories. Last year, some of the results surprised me and I previously posted my thoughts. What had most surprised me were some of the omissions as well as a few of the places received the Best votes. So it is time for me to dissect some of the list of winners again, to see where I may agree or disagree. I had complained last year that though there is a listing for Liquor Store there is not a separate category for Wine Store. This year, they still do not have a separate category for Wine Store and I still think they should. We have seen a number of stores in the last few years that concentrate primarily on wine. I don't think they can be adequately compared to a general liquor store. As for the specific winners, I am surprised that the Grapevine Travelers, a very good wine store, did not make the list in Medford. Which could be due to the lack of a separate category for wine stores. In Saugus, though OurGlass Wine Co. received an honorable mention, I do think they are better than the winner, Nasty Nonnis. I was glad to see that The Wine Shop of Reading and Rapid Liquors took top honors in Reading and Stoneham. I was pleased to see that Pignone's Cafe was the #1 Choice of Restaurant for Breakfast in Stoneham. They certainly serve an excellent breakfast. Though I do think that the Dairy Dome is deserving at least of an Honorable Mention. Their D-Boy spucky is an excellent breakfast sandwich. I think the Dairy Dome also should have be on the list for Restaurant for Lunch as well as Restarant for Takeout. Plus, where are the mentions for Georgie D's Place? Georgie D's makes excellent Italian food and they are open for both lunch and dinner. Yet they did not receive any mention on Restaurant for Lunch, Restaurant for Dinner, or Fine Dining Restaurant. They only received an Honorable Mention for Italian Restaurant. Melissa's Main Street Bistro (the former KroMels') received an Honorable Mention for Fine Dining Restaurant. But they did not receive a mention for Restaurant for Steak. And they do deserve such a mention. As for Pizza Place, one of my favorite places in Stoneham was omitted, Pizzamia. And for Saugus, there was no mention for Angela's Coal Fired Pizza. So, what do you think of the list of winners? Do you agree or disagree? Did one of your favorites fail to make the list? I had been hearing some good things about Fuloon Restaurant, a Chinese restaurant on Main Street in Malden. So I thought I would stop by for their all-you-can eat Lunch Buffet. The buffet is served Monday to Friday, 11:30am-2:30pm, and only costs $6.25. It is a small restaurant though they have great a large menu. Besides the lunch buffet, there are numerous Lunch Specials and Rice Plates that you can order. The buffet consists of two long tables of food, one generally containing appetizers and desserts and the other entrees and soups. I arrived around 11:40am, so very soon after the buffet opened. I figured that everything should be the freshest at that point. I found most of the food to be luke-warm at best. It had obviously been set up earlier than 11:30am. The selection was mostly the same type of items you find on almost any other Chinese buffet, except for a couple things. Crab Rangoon, Chicken Fingers, Chicken Teriyaki, Steamed Ravioli, Vegetable Tempura, Egg Roll, etc. Vegetable fried rice, General Gao Chicken, Beef with veggies, Egg Drop Soup, etc. Quality wise, the food was average, comparable to most other Chinese buffets. Nothing exceptional but decent food at a cheap price. I expected more based on prior comments I had heard about the restaurant. Though maybe their dinner meals are better. I would not hurry back here for lunch. The 6th Annual Tanglewood Wine & Food Classic will be held August 7-10, 2008. Come out for all four days, or make the Grand Tasting a day trip from Boston with bus service leaving from Symphony Hall and Riverside-MBTA Station. Bus departs Symphony Hall at 9 AM, departs Riverside at 9:30 AM and arrives at Tanglewood by noon. Bus returns to Boston at 4:30 PM. Cost is $30.00 round-trip. 5th Annual Wine Auction Dinner at Serenak: Dinner prepared by Jeffrey Thompson, chef at Wheatleigh (Lenox) and Damian Sansonetti of Bar Boulud (Manhattan), paired with wines provided by Pride Mountain Vineyards, and presented by Stuart Bryan, General Manager. Auction featuring large format and hard-to-find wines. All proceeds benefiting the Boston Symphony Orchestra. Wine Seminars, Great Wines in Grand Houses, Meet the Winemaker Reception, and Winery Dinners at Lenox-area restaurants. Wine Seminars, Great Wines in Grand Houses. The Grand Tasting: Wine tastings from over 100 vintners, including Allan Scott Winery, Archery Summit, Café Europa, Duckhorn, Evans & Tate, Goldeneye, Hall Wines, Jackson Estates, Kendall-Jackson, Landmark, Loire Valley Wine Bureau, Michel-Schlumberger, Mionetto, Morgan, Paraduxx, Pine Ridge, Rodney Strong, Tamas, Tapestry, Teatown Cellars, Treana, Wente Family Estates, and many more. Watch celebrity chefs from renowned restaurants, including Brooke Vosika from Aujourd’hui, Andy Husbands from Tremont 647, Jeff Thompson from Wheatleigh, All Kovalencik from Company of the Cauldron, Chris Prosperi from Metro Bis, Jason Merrill of The Hanover Inn, Jeffrey Fournier from 51 Lincoln, and Michael Stahler from Bistro Zinc display their talents during 45-minute cooking demonstrations at Viking kitchen stages. Other participating restaurants and food purveyors include Sandrine’s, Tillen Farms, Chocolate Springs, Canyon Ranch, Farmstead, Asters, and many more. Special guests include Stuart Bryan of Pride Mountain Vineyards, photojournalist Lincoln Russell of Lenox, Chris Deas of Italian Wine Merchant, and Josh Needleman of Chocolate Springs. To view the complete schedule or to purchase tickets for the Grand Tasting or any of the events, please call 888-266-1200 or visit Tanglewood Wine & Food Classic. Sponsors: The Tanglewood Wine and Food Classic is sponsored by: Viking as the Presenting Sponsor and joined by Saveur, Lux, Bond & Green, Colonnade Hotel, SAAB, St. Germain, Boston Common, Cayman Islands Department of Tourism, Vacation Village, San Pellegrino, Aqua Panna, Samuel Adams, iGourmet, Destination Cellars and Vintage Makers. Jonathan Alsop of the Boston Wine School is holding a Wine Writers Workshop on four Mondays, June 30 to July 21, from 6:30-9pm. If you already write about wine or would like to start doing so, then you could benefit from this class. "Have you been dreaming about taking your love of wine and words to a new -- maybe even professional -- level? If you've always wanted to write about wine and food, you owe it to yourself to devote four Mondays to making that dream come true. This freewheeling Wine Writers Workshop is for writers at any level of experience and development. If you're a beginner, we can get you started on the road to writing about wine and selling wine articles. If you have "works in progress," we'll workshop those pieces and move them along to the polishing stage. You'll learn what editors and publishers are looking for and how to pitch story ideas that really sell. We'll study different ways to structure wine articles, how to write interesting and engaging tasting notes, and how to bring your wine love to life. Most importantly, we'll focus on writing about wine as a process -- not just a product -- and how to get to the story behind the bottle." The class costs $135 and you can sign up online. Special discount stipends are available for a limited number of students. For more information, contact Jonathon at wineclass@bostonwineschool.com. I will be attending this class so maybe I will see you there. And I will report back when the classes are complete as Alsop will probably run this class again in the future. Troquet, a French restaurant and wine bar, have announced a new addition, Le Patissier. Le Patissier is a desserterie serving decadent plated desserts every Tuesday-Saturday, from 5pm-11pm on the lower level of Troquet. Le Patissier, at 140 Boylston Street near the Colonial Theatre, offers theatre-goers an indulgent way to elongate their evening. Le Patissier is a unique space with 15 foot pumpkin walls, brought to sugary life with photos by local artist Andy Ryan, which are reflected in oversized mirrors. Reservations are accepted at 617-695-9463. As a special bonus, here is a recipe from Sarah Woodfine. Grease a 9 X13” baking pan, then cover the pan with plastic wrap, pressing it tightly to the shape of the pan to avoid any air pockets. In a microwave, melt the butter and chocolate together. Stir and set aside. On highest speed, beat the eggs and sugar until light and fluffy then fold that mixture into the chocolate mixture. Using a large whisk, beat down any air bubbles, then pour batter into the lined pan. Cover pan with aluminum foil. Add water half way up the sides of a slightly larger baking pan to make a water bath. Bake cake at slightly under 300 degrees for about 75 minutes. NOTE: It is important to allow the cake to cool and rest in the refrigerator for 24 hours before slicing. Have you ever heard of WineS Magazine (the "S" standing for "Simplified")? I had never heard of it before I stumbled upon a copy in a local book store. Their website says almost nothing about the magazine, mainly allowing you to sign up for a subscription. The magazine is published bimonthly and I bought the June/July 2008 issue. It is noted as being Vol.2 No.3. So, the magazine may have started up last year. In persuing the contents of the magazine, it is truly dedicated to "wine simplified." It seems more like a magazine for those new to wine, for people who want to learn more about wine but in a very unpretentious manner. Though even those more knowledgeable about wine may find a few items of interest. For example, one of the first articles, Wine Observer, are a serious of brief news articles about wine related topics. These items would appeal to any wine lover, and not just someone new to wine. There is an article on making Toasts, which includes common toasts in other languages as well as the origins of a few common toasts. Another article is on Taste, and how a wine can change with when, where, why and how you drink it. You can also learn about Organic/Biodynamic wines, wine making in San Diego, and how to open a bottle of wine with various corkscrews. There is even a two-page dictionary of wine words with definitions. There were no wine reviews, no scores for wines. It is more of a wine educational magazine than a wine review magazine. As such, I think it fills a nice gap in the world of wine magazines. It is a very approachable magazine and won't make you feel ignorant. The articles are well written and appear well researched as well. If you want to learn more about wine, the I very much recommend you check out this magazine. Another hot day so time once again for a Rosé! On my recent trip to Best Cellars, I purchased a couple bottles of the 2007 Quinta Da Alorna Vinho Rosé, a Portuguese Rosé ($11). (Note that the winery website is only in Portuguese). Best Cellars has this wine listed under their "Juicy" descriptor. This Rosé is from the Ribatejo region of Portugal and is made from Touriga Nacional, an indigenous Portuguese grape. This grape is known for being fairly tannic. The Rosé has an alcohol content of 13%. It has a deep pink color and on the nose has aromas of strawberries and a touch of violet. It is a delicious Rosé, with lush strawberry flavors that pleased my palate. It is a dry wine, more Old World in style, and there were no issues with any tannins. In fact, it was smooth and very easy drinking. It was crisp and light, just perfect for the weather. There was certainly no problem finishing this bottle of wine. And I am glad that I have at least one more bottle of it. I highly recommend this Rosé. It is a good value and it is extremely pleasing. The theme for Wine Blogging Wednesday #47 has now been announced and it is definitely something original. Erin and Michelle of Grape Juice are this month's hosts and their theme harkens back to my childhood, to the days of Sesame Street. Their theme is: Today’s Wine Brought To You By The Letter “S”. What does that theme entail? You have tons of leeway for this tasting. Just find a wine with a word starting with the letter "S." That "S" word must be directly related to the wine, such as its region, appellation, producer, varietal, style, winemaker, etc. That certainly opens up the field to many different types of wines. I don't think anyone is going to have any trouble finding a wine to fit this theme. It may take a little time only if you try to be clever with the theme, such as trying to find a wine that is related to multiple "S" words. But then that could be very fun as well. On or before, Wednesday July 9th, post your tasting review on your blog, place it in the comments on and simply scribble a note on your tasting experience and post it to your blog, in the comment thread on Grape Juice or at the Wine Blogging Wednesday site. Please email Erin with a link to your review (erin@grapejuice.ca). So what are you waiting for? Start thinking about what wine to taste for WBW #47! Trader Joe's has their own brand of Saké, a Junmai Ginjo, which sells for about $10 a bottle. I think it is a good tasting Saké and a great value for the price. I recently found that they also carry a Sparkling Saké. Trader Joe-san's Sparkling Saké is sold in 330 ml bottles ($5.99) and is produced and bottled by the Ume No Yado Brewery Co. in Nara, Japan. It only has 6-7% alcohol content so it is a light beverage. It is meant to be served chilled. The colored bottle does prevent light from negatively affecting the Saké. I found this Saké to have a bit of a fragrant nose with some rice aromas. On the palate, it has a mild carbonation, a bit frizzante. It is full-bodied with strong rice flavors as well as some mild fruit. It is rather dry and would be refreshing on a summer day. But, it is probably not a Saké for someone new to Saké. The strong rice flavor may be offputting to some. Though I generally think Sparkling Saké can be a good way to introduce someone to Saké, this would not be my choice for such an introduction. I enjoyed it, and think it has a good price, but I don't mind the rice flavors. While in the South End this weekend, I decided to check out Orinoco for lunch. Orinoco is a Venezuelan restaurant, inspired by the taguaritas-- small, casual, rustic, and inviting eateries found along Venezuelan roadsides. It is a small place, homey in appearance and they did have several tables set up on the sidewalk as well. It is a causal place which I hear gets very busy in the evenings. Today for lunch though, there were plenty of empty tables so I did not have to wait. The lunch menu has plenty of different choices, including Antojitos (little cravings-akin to appetizers), Arepas, Empanadas, Salads, Sandwiches, Entrees, Sides and Desserts. Most of the prices are in the $5-10 range, making this an inexpensive place to grab a bite. I wanted to start with the Tequenos, guayanes cheese wrapped in flaky dough and served with chipotle ketchup, but they were out. The menu mentions that the guaynes cheese is imported and is not always available. So, I decided on the Maracuchitos, queso paisa wrapped in sweet plantains ($4.50). This dish consists of four Maracuchitos, a small rectangle of cheese surrounded by large pieces of fried plantains. This was just ok as the plantains were a bit overcooked and the cheese was so small that you lost much of its flavor. The plantains were sweet and definitely would have been better if they were not cooked as much. For my main meal, I chose the Mechada Arepa ($5.95). An Arepa is a traditional Venezuelan grilled corn pocket sandwich. They are at least a half dozen different types of Arepas you can order. The Mechada consists of Venezuelan-style stewed shredded beef. The Arepa resembles a large English muffin and it is sliced to create a pocket for the meat. The Arepa is delicious, with an excellent taste of corn. It is moist and stands up to the meat without falling apart on you. The Mechada was tasty, with plenty of juicy shredded meat and small bits of onion. Overall, this was an excellent sandwich at a reasonable price. I definitely think the Arepa makes for a good alternative to other types of breads. I will return to Orinoco to check out some of their other dishes. And probably have another Arepa. As I mentioned previously, this past Thursday I visited Wine••Sense in Andover for a tasting of some Italian summer wines. Eileen Wright of Adonna Imports presented four different Italian wines, including two whites, a rose and a red. As usual, these wines from her portfolio were excellent choices. First up was the 2005 Castel Noarna Nosiola ($18). I have had this before recently and it is an exceptional white wine. The Castel Noarna winery is located in the Trentino region of Italy. This wine is made from 100% Nosiola, an indigenous Italian grape that is the only native white grape remaining in Trentino. It is starting to see a slight resurgence as some good wines have been produced from it. And this wine showed that potential. This wine was fermented in stainless steel and then aged for nine months in neutral oak barrels. It has an alcohol content of 12%. It had a pale yellow color with an intriguing nose of spice and minerals. On the palate, it was crisp with a nice melange of flavors including grapefruit, mineral notes, and spice. It gave off an exotic feel and definitely tantalized my taste buds. This is a wine I would highly recommend. Next was the 2006 Valle d'Aosta Petite Arvine, Institut Agricole Régional ($24). This wine is produced by a winery that is also a research institute. 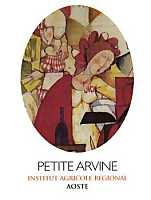 Petite Arvine is a white grape that grows primarily in Switzerland and the Valle d'Aosta region of Italy. Interestingly, the picture on the label is a small section from a much larger painting. All of their wines uses different sections of the painting, Eileen told us that it took them almost three years to get their label approved by the FDA because of the woman's breasts. Certainly seems rather silly when you consider some of the other labels out there, plus that this label is from a more famous painting. I enjoyed this wine. It had a nice citrus smell and those citrus flavors blossomed on my palate. A bit of grapefruit, lemon and orange peel. It was very crisp with touches of minerality as well. It had a long finish and definitely makes a nice summer wine. Another wine I would recommend. We then moved in to the 2006 Massa Vecchia Rosato ($46). Fabrizio Niccolaini runs Massa Vecchia, a very small winery which is just 8.6 acres. It is planted with at least a dozen indigenous Italian grapes, both red and white. All vines are also at least 35 years old. In addition, they practice biodynamic agriculture. This Rosato is certainly very different. First, the color is a deeper red and not the usual pink that you would expect. By looking at it, you would not consider it a Rosato. The wine is made from 60% Merlot and 40% Malvasia Nera. It is also aged in chestnut barrels rather than oak, giving it a different taste. This is a wine you should let and breathe for a bit as it has a rather funky nose initially that mellows out over time. Initially on the palate, it is also a more brash wine, almost a discordant mix of tastes. Yet with some time, it smooths right out, presenting an appealing melange of dark fruit flavors, some earthiness and a touch of minerality. This is not a typical Rosato. It is pricey so it is more a special occasion wine. Finally, we had the 2005 Mandino Cane, Dolceacqua Superiore "Arcagna," ($27). This wine comes from the Rossese di Dolceacqua DOC in Liguria. The winemaker, Mandino Cane, is elderly and he recently sold off this vineyard for this wine so this will be the last vintage. The wine is all organic and is made from the Rossese grape which generally makes savory, woodsy red wines. This is a light colored red wine with a fruity nose and packed with plenty of complex flavors. It has a delicious lingering finish and is light enought for a summer BBQ. It should pair well with many different foods. Another fine choice. While persuing Local Wine Events, an excellent site for listings of upcoming wine events all across the country, I noticed a listing for Wine••Sense, a wine store in Andover. I had never heard of this wine store before so I checked out their website for more information. Their site is essentially a one-page newsletter, posting a list of upcoming events along with some very basic information about the store. On June 19, Eileen Wright of Adonna Imports was presiding over a tasting of some Italian summer wines. I am a big fan of the wines of Adonna Imports and also know they generally only distribute their wines to small, more unique wine stores. So I decided to attend the tasting and check out the store. Wine••Sense is located on North Main Street (Rt.28), just a short bit north of The Cupcake Boutique. But Wine••Sense is nestled in the back of a small commercial complex so it is not easily visible from the road. It is close to the Whole Foods Market so you can use that as a landmark. You can even park in the Whole Foods Market lot. The store itself is small, a single room, which their business card describes as "0.005574 hectares of meticulously-chosen wines from around the world." Most of the wine shelves looking like the photo above, presenting the wines so it is easy to read their labels. That makes browsing simple. There is a small refrigerated unit and they will be adding more refrigerated units in the near future. I estimate they have about 200-250 different wines in stock. In the middle of the store is an island where the tastings are held, and also where some of the wines are stored. They also sell some Riedel stemware. Samanta Turner is the owner of Wine••Sense and is a petite woman filled with passion and energy. She is also very personable and I spent a little time chatting with her about the store. It has been open for a couple years. Samanta generally stocks the wines she enjoys drinking. She does not carry the mass-produced wines, the "usual suspects" as I say, which are available in many other wine and liquor stores. Instead, she seeks out quality wines that may be a bit less known. She is conscious of her customers though and tries to keep the prices of the wines at a reasonable level. I was impressed by her selection of wines. Many of her Italian wines are from the Adonna Imports portfolio so I know they are generally excellent wines. I was familiar with some of the other wines as well, and those I knew were very good choices. It is definitely more of a boutique winery, with a more intriguing selection than a local package store. These are wines that most people would enjoy, if they gave them the chance. Though they may seem unfamiliar, they are wines very much worth drinking. Prices for their wines are comparable to prices in other similar wine stores. So they have not marked up the price of their wines. I was also impressed by Samanta's passion. She has been involved in the food and wine industry for about fifteen years and she obviously has a great love of wine. And this wine store is where she can do what she loves and where she can continue learning about wine. As I have said repeatedly, it is such passion which is a primary ingredient in all of the best places. She is not pretentious in the least and seems to embrace the joy and fun of wine. It was a real pleasure to talk with her. I will be returning to this store for future tastings as well as just to check out what new wines they have available. I will be discussing the Italian summer wines tasting in a separate post but do want to mention a couple things here as well. First, a few members of North Shore Winers also came to this tasting with me and they all enjoyed this wine store. Second, as it is a small store, tastings could get crowded if a large number of people showed up. Thursday was not a problem though as there were only about 12-15 people present at any one time. This is definitely a wine store which I recommend. If you are in the area, stop by and check out the store. Or make a special trip to Andover to visit the store and hit some of the other sites as well, such as The Cupcake Boutique. Bin Ends is a new discount wine store in Braintree and I previously gave it a very positive review. I very much like their philosophy and they have an excellent selection of wines, at very good prices. It is well worth visting this wine store and I bet you won't be able to leave the store without buying something. Bin Ends has also embraced the new social media like Twitter and Facebook. I have been following them on Twitter for awhile and much of what they have been sending is information about the wines they have for sale. But they are now expanding the content of their Twitters. They are going to use Twitter to run "Twitter Taste Live" and just announced it on their blog. The essence of this new project is that Bin Ends will bring together famous wine personalities with consumers from all over the world through Twitter. At specific times, Twitter users will be able to taste wines from these wine makers and use Twitter to comment live about the wines as well as to ask questions of these wine makers. Twitter posts have a limit of 140 characters so it makes for short comments. Veteran Twitterers soon learn how to make every character count. I think this is an excellent and innovative idea and a great use of Twitter by a wine store. It is not the usual spam comments. It is a way to promote their store but also to bring together wine lovers, to help educate, and to connect consumers with wine makers and more. I am very much looking forward to these Twitter Tastings. Kudos to Bin Ends! It is very simple to participate. Just sign up for a free Twitter account and then "follow" BINENDSWINE on Twitter. The dates, times and speakers for the upcoming Twitter Tastings will be announced both on Twitter, Facebook as the Bin End's website. These Twitter Tastings will commonly be held on the third Thursday of every month at 7pm EST though the date and times will sometimes vary. The wines for these Twitter Tastings will be available at least 3 weeks prior at Bin Ends. And they will ship for free across the U.S., to wherever they can deliver. Bin Ends will announce their first 3 guests early next week. I recently gave a rave review to The Cupcake Boutique in Andover. Yesterday, as I was going to attend a wine tasting in Andover, I decided to stop once again at The Cupcake Boutique. Would the cupcakes still be as good? And what other pastries or baked goods would they have available that I could sample? Above, you can see their intriguing cupcake display. As it was later in the day, a couple hours before closing, they had limited quantities of some of the cupcakes though still a decent selection. There were a few new cupcake flavors including Pink Lemonade and Vanilla with Caramel. At the very top of the display, though it is hard to see the details, they have some brownies and chocolate chip cookies. I bought some cucpakes, mostly flavors that I had not tried before, including Triple Chocolate, Mocha, Vanilla with Caramel, and Pink Lemonade. I also got another Coconut Snowball, my favorite. When I got the cupcakes home, they had sit for a bit so the frosting was soft and creamy rather than the firmer consistency they have when they have been in the refrigerator. I appreciated the frosting even more in the softer condition. The cupcakes were all moist and flavorful. I did not have any problems with dry cupcakes. And the different flavors were all very good. Though none can still compete with the Coconut Snowball. So The Cupcake Boutique has shown consistency in their product. I also tried a Brownie ($2) and a Chocolate Chip Cookie ($1.50). The brownies are thin but wide so you receive a good-sized brownie. Brownies are usually either fudgy or cakey and this brownie was the fudgy type. In fact, it is very moist and chocolatey. If you love chocolate, then you are going to very much enjoy this brownie. It is very good alone, though probably even better topped by ice cream. The Chocolate Chip Cookie definitely did not resemble the usual such cookie. Rather than a plain brown cookie, there are swirls of chocolate throughout this cookie, giving it more of a speckled look. They did more than just add some chocolate chips to this cookie. The cookie was soft, moist and quite chocolatey. An interesting variation of the usual such cookie. The brownie and cookie showed me that they don't just do cupcakes well. All of the desserts I have tried so far have shown moistness, usually indicative of freshness and quality. They have all tasted delicious and certainly would appease any chocolate craving. I continue to highly recommend that you check out The Cupcake Boutique. The region’s largest Bastille Day celebration, free and open to the public, takes place on Holyoke Street in Cambridge, on Sunday, July 13 from 1:00 PM to 10:00 PM. Here is some of what you will find at this celebration. Sponsors of this gala celebration are: Harvard Square Business Association, Sandrine's Bistro, Maison Marques & Domaine Wines, and Nestle Waters. Sandrine's Bistro will offer a revolutionary $25 prix fixe menu from Friday, July 11 until Monday, July 14 at café tables along the sidewalk. My most recent column for the Stoneham Sun newspaper was an article on Rosé wines. I am a big fan of Rosé wines although I know there are many who are disdainful of them. Much of that disdain is due to misconceptions about Rosé wines. They are definitely not all like White Zinfandel. There is even a group, Rosé Avengers and Producers (RAP for short), dedicated to spreading the word about Rosé wines. This international group is composed of winemakers and wine drinkers who want raise awareness of how good Rosé can be. Their website has a list of articles about Rosé, upcoming Rosé events, and more. Check them out and maybe join them. Come and celebrate Bastille Day at The Beehive! Boston will become Paris for only one day this year and in only one location. On July 14, 2008, from 5:00pm-2:00am, The Beehive will celebrate with their Bee-Musette at St. Germain des près. This will be held ration in cooperation with the French Consulate of Boston, The French Library, TV5 Monde and Les Champagne Mumm. Saint-Germain-des-Prés is an area of the 6th arrondissement of Paris, France, located around the church of the former Abbey of Saint-Germain-des-Prés. Home to a number of famous cafés, such as Les Deux Magots and Café de Flore, the Saint-Germain-des-Prés area was the center of the existentialist movement (associated with Jean-Paul Sartre and Simone de Beauvoir). The French Consulate will also be presenting The Beehive with a special plaque honoring the location for their French contribution to the city of Boston. The French Navy will be in attendance and there will be more berets and scarves than you can shake a stick at! This event is free to the public and is based on capacity. Dinner reservations are highly recommended which will get you a front row seat to all the action. The Beehive’s live Music performance for the evening will be from 8:00 PM to 10:30PM and the DJ will perform from 10:30 PM to 1:30AM. The BEEch, The Beehive’s outdoor patio will be open during the event serving their regular menu and is on a first come first serve basis. My new column of "A Passionate Foodie" can be found in the June 18 issue of the Stoneham Sun newspaper. This is a weekly column that concentrates on reviews of local restaurants though it may also touch on a few other food and wine topics. The new column has been published today and is also available online. The new column provides some recommendations for Rose wines. Rose wines are dry wines with plenty of intriguing fruit flavors. They are great summer wines and are very food friendly. Over the weekend, while wandering through Coolidge Corner, I stopped at Best Cellars, a small chain wine store. They carry only about 100 different wines, most costing $15 and under. They also classify their wines based on taste and style, rather grape or place of origin. They divide their wines into eight categories, including Fizzy, Fresh, Soft, Luscious, Juicy, Smooth, Big and Sweet. This seems directed more to people who don't know a lot about fun, to make it easier to find wines in a style they prefer. I think such a system does have some value, especially if it can get people to try new wines. I think they have a decent selection of wines, and I sometimes find some good buys there. On this trip, one of my finds was the 2005 Stormhoek Pinotage ($14) from South Africa. I love Pinotage so wanted to try this, especially as I knew the Stormhoek name yet had never tried one of their wines before. Stormhoek got a lot of publicity from its blogging, certainly an admirable achievement. The Stormhoek Winery is located in the Western Cape of South Africa. It was started by an international team of wine consultants, writers, and oenologists seeking to produce wines of the highest standard. They want to produce fresh wine and each bottle possesses on its label, an “Ultimate Freshness" indicator. The indicator tells you when the wine will be the freshest, which years you should drink the wine. The 2005 Pinotage is best through 2008 so I should not wait too long to drink this wine. The bottle also has a screw cap closure, which they feel is the best seal for wines that need to stay fresh and bright. I brought this wine to a Father's Day BBQ and it was a big hit. The wine has a dark red color and an intriguing nose of black cherry and ripe plum. On the palate, you are rewarded with lush fruit flavors, vibrant black cherry, blueberry and blackberry as well as a bit of smoke and spice. It is very smooth and easy drinking. It made for an excellent BBQ wine, and I would have enjoyed it alone as well. It lacks any of the earthy smells or tastes that are sometimes associates with Pinotage. So it will appeal to a wide audience, including people who claim they dislike Pinotage. I suggest serving this wine without letting the guests see the bottle. I bet many of them will enjoy it, even if they generally do not like Pinotage. This is an excellent value and I look forward to trying future vintages of their Pinotage, as well as some of the other Stormhoek wines. Is Christianity Responsible For Great Wine? When we discuss great wines, there is often discussion of terroir, skilled wine making and expert viticulture. Yet how often do you hear that Christianity is responsible for great wines? Have you ever heard that? In the latest issue of Decanter (June 2008), there is a brief article with statements by famed Spanish winemaker Alvaro Palacios. His best wine is L’Ermita from the Priorat region, a wine that has international renown. Alvaro has stepped forward to make a bold statement, to give much credit to Christianity for good wine. Alvaro stated: "Good wine comes from godly places. I am not crazy--I really want people to know how important this is. I don't understand why no-one else appreciates that the monks were the ones who chose the best places for vineyards. I'm not claiming that non-Christian countries can't produce good wine. But in Alsace, Burgundy, Bordeaux and Spain--in Priorat for example-- it's the same. These vineyard sites were gradually selected over hundreds of years; these places are mystical. Other wines are good but I truly believe the greatest wines come from religious regions." Do his statements have any validity? If so, how much validity do they possess? Coincidentally, I have been reading a new book, Bordeaux/Burgundy: A Vintage Rivalry, that touched upon exactly this topic. Historically, it probably cannot be denied that the Church played a significant role in promoting vineyards and wine making. Even in California, the Church played a large role in such, including even during Prohibition. But, how much impact did the Church have in determining the locations of vineyards? What were the factors involved in their decisions as to where to plant grapes? Are these sites truly mystical? Or is some of it merely chance? What is needed is a deeper examination and analysis of the history of Christianity and wine making. We need to determine why did the Church planted vineyards in certain areas. We need to determine whether the Church simply protected vineyards that had been planted previously, by secular individuals or organizations. It is an intriguing topic that hopefully will receive more attention in the near future. Today would have been the 105th birthday of Ruth Graves Wakefield, the inventor of the chocolate chip cookie. Ruth was born on June 17, 1903 in Whitman, Massachusetts and later died on January 10, 1997. She originally worked as a dietitian. She and her husband eventually bought a historical tourist lodge in Whitman. The lodge had been built in 1709 and had a rich history. They named the lodge The Toll house. Ruth did all of the cooking and was especially famed for her desserts. She invented the chocolate cookie there in 1933. One of her favorite recipes was for Butter Drop Do cookies. One day, in 1933, she found that she had run out of baker's chocolate. As a substitute, she used a semi-sweet chocolate bar, cutting the bar into tiny pieces. Once the cookies were done baking, she found that the chocolate had not melted, but rather was soft and creamy. And people love these new cookies. Interestingly, the person who gave Ruth the semi-sweet chocolate bar was Andrew Nestle of the famed Nestle Chocolate Company. Sales of these chocolate bars then began to skyrocket. Nestle eventually decided to offer the chocolate as the now familiar "chips" rather than make their customers have to chop up the bars on their own. In 1939, Nestle also made a deal with Ruth to place her recipe on their chocolate packages. As part of the deal, Nestle agreed to supply Ruth with chocolate for the rest of her life. Sadly, The Toll House burned down in 1984. But Ruth's memory lives on. Chocolate chip cookies are one of the most popular cookies, especially for those who bake their own cookies. When Do You Send Back a Wine At A Restaurant? In an earlier post today, I mentioned how I recently dined at Excelsior Restaurant. While there, I could not help but over hear a conversation at the table next to mine. And once I heard a little bit of it, I carefully listened to hear even more. The conversation had to do with wine. In fact, the table wanted to send their wine back because they did not like it. At the table next to me, there were three couples, probably in their 30s or early 40s. They ordered a French Meursault, and I believe it was the 2002. The Meursault wines on the list started at $100 a bottle and went as high as $370. The 2002 was a Marc Colin, Les Charmes 1er Cru ($175). The bottle was brought to the table, they tasted it and began drinking. At some point later, they asked the waitress to see the wine steward, so he could taste the wine. Basically, the customers just did not like the wine. It was not corked. They just did not care for its taste. The wine steward tasted the wine and found nothing wrong with it. Yet the wine steward, to please the customers, took back the wine and brought them a different wine instead. That impressed me. The restaurant would have been full in their rights to tell the customers that they had selected the wine, that it was not corked and that they had to keep it. But they did not do so. Instead, they agreed to accept the loss of that bottle of wine to satisfy the customers. To me, that is certainly a restaurant which highly values customer service. I was appalled by the behavior of the customers in this instance. If you order a wine at a restaurant, basically the only valid reason to send back the bottle is if it is corked. Just because you do not care for its taste, that does not give you the right to send back the bottle. If you are particular, then do not order something unfamiliar to you. Don't take any chances. Maybe whoever ordered the Meursault was trying to impress the others, without really knowing what he was ordering. In the end, they made the restaurant lose a bottle of wine that was worth over $100. Which contributes to restaurants pricing their wines as high as they do. I have taken plenty of chances when ordering wine at restaurants. And I would never even consider trying to return the wine just because I did not like it. I take responsibility for my wine buying decisions. If the wine were corked, I would definitely send it back. Though that has yet to happen to me. Wine is not an inexpensive beverage. It is not like sending back a cup of coffee or a soda. So it should only be done when absolutely necessary. And these customers at Excelsior did not have a valid reason to return their wine. Kudos to the staff of the Excelsior though for accepting the wine back, even though they knew it was a loss for them. At the Boston Wine Expo, I won a $100 gift certficate in a raffle to the Excelsior restaurant. I finally dined there this past weekend. The restaurant is easy to find, across from the Boston Public Garden, and they have valet service ($16). On the first floor of the restaurant is a bar with some patio seating. The main dining room though is on the second floor. You take an elevator, which runs parellel to the restaurant's wine tower. The three-story wine tower holds about 9000 bottles of wine and was certainly a nice view on the elevator ride up to the dining room. The dining area is elegant without being pretentious. We were seated at a table not too far from a window overlooking the Public Garden. I first perused the voluminous wine list which has many intriguing bottles, both well known as well as some less common choices. Prices generally run about two to two-and-half times the usual retail price. They even had several different wines from one of my favorite producers, Sean Thackrey. I was interested in a Spanish wine from the Montsant region, the 2004 Mas de l’Abundancia Fluminus ($65). I had not heard of the wine before though was familiar with the region. So I decided to ask the wine steward about the wine. Unfortunately, it was quickly clear that he knew nothing about the wine, though he tried to fake it a bit. When I asked whether it was a Garnacha based wine or not, he did not know and talked about how young Spanish wines were often tight and needed decanting. He also pointed me to a Spanish wine from Alicante that was 100% Monastrell. Nothing like the Montsant wine. I would rather he was just upfront, told me he knew nothing about the wine but that he would check and see if he could get more info on it. I decided to order the wine anyways, as I knew the type of wines usually from Montsant. It turned out to be a blend of 50% Cabernet Sauvignon, 30% Garnacha and 20% Carineña. It turned out to be an excellent wine, full-bodied with plenty of excellent fruit, smooth tannins and some intriguing notes of chocolate. The food menu has plenty of interesting options including a raw bar, appetizers, entrees and side dishes. The menu is apparently seasonal, capitalizing on which ingredients are freshest. Most appetizers are $10-20 while most entrees are in the $30s except for the beef and lobster dishes which are in the $40s. While persuing the menu, we were brought a basket of breads with butter. There were several different types of bread, all warm, and also very tasty. This was certainly a good start to the meal. We started with a couple appetizers. The Iced Wild Texas White Shrimp ($18) comes with a Smoked Red Pepper Cocktail Sauce. You received five quite large shrimps that certainly seemed fresh and were very good. The Vanilla Skewered Hudson Valley Foie Gras ($24) comes with Peppered Brioche, Strawberry-Rhubarb Compote, 10 Year Old Balsamico, and Ground Pistachios. The menu neglected to mention that there were some onions between the foie and the brioche. To me, I don't think onions and foie really mix well. The foie itself was good, a nice silky and buttery flavor. It mixed well with the sweet and bitter flavors of the compote with the touch of baslamico. The nuts even made an interestind addition. For entrees, there was the Skillet Seared Tuna & Braised Beef Short Rib ($36) with Risotto Verde and Orange-Anise Gastrique. The tuna was a large chunk of fish, seared on the outside and raw inside, cooked just as it should be. The tuna was tender and flavorful. The short rib was small but tasty, though it seemed to suffer a little from being paired with the more compelling tuna. Maybe it would have been better with two different fishes, rather than the tuna and short rib combo. My own entree was the Juniper Roasted New Zealand Venison ($39) accompanied with a Chevre-Boar Bacon Blintz with a Sauce Roebuck. The venison was served medium rare, though tending on the rarer side, which was perfect for me. You received three large slices of venison, which was tender and absolutely delicious, especially in the dark Roebuck sauce. It had absolutely no gaminess. Just a fantastic cut of meat. The blintz was also quite good, with a creamy Chevre, a light crepe and a smoky bacon flavor. I would highly recommend this entree. We also ordered a side of the Sweet Potato Steak Fries ($8) with Ginger, Garlic and Thai Chili seasonings. You receive a large bowl of long, thick fries that were cooked perfectly. The sweet potato was the right firmness, neither too soft or too firm. And the seasonings were milder than expected but added an excellent flavor to the fries. This was a definitely a winner for me. For dessert, we decided to split the Excelsior Cheese Selections ($20). This consisted of three different cheeses, including a sheep's milk from the Pyrenees of France and a local Vermont cheese. The cheeses were accompanied by some glazed figs, a strawberry sauce with black pepper an another fruit compote of sorts. Plus, there was a fruit and nut cake and a side of pine nuts in honey. For the cheeses, we also received a selections of breads and crackers. This was an exceptional dessert, with three creamy and flavorful cheeses. I especially enjoyed the pine nuts and honey atop the cheeses, as well as the black pepper sauce. There was plenty of food for two people and it is an excellent way to end your meal. Service was very good, except for the minor issue with the wine steward I mentioned above. I was surprised that the restaurant was not that busy on a Saturday night. There were a number of empty tables available. The food was generally excellent, though a couple of the combinations did not work for me. I enjoyed my visit here and would return again. And in a separate post, I will go into more detail about how the restaurant impressed me in how they handled a different customer. This past Thursday evening, I stopped by Salem Wine Imports for a special wine tasting. Some members of the North Shore Winers, as well as a few other friends, joined me for this tasting. Bob Z. of United Wines, a local wine distributor, was presenting six higher-end wines, wines he felt that aptly deserved their higher prices. You don't often get to taste such wines, so these tastings are must attend events. I should note that there were special discounts for all of these wines. Under each wine, you will note three prices. The first is the usual retail price. The second is the discounted price if you uy 1-5 bottles, and the third is a discounted price for if you buy 6 or more bottles. First up was the 2005 Landmark "Overlook" Chardonnay ($32.99/ $28.00/ $26.39). the owners of Landmark Vineyards are descended from the famous John Deere (inventor of the steel plow). The names of their wines thus reflect that heritage. For example, Overlook was the name of one of John Deere's homes. The grapes for this wine are sourced from several different areas, including Sonoma County, Santa Barbara County and 9% Monterey County. The wine is barrel fermented using indigenous yeasts and undergoes full malolatic fermentation. The wine is also aged sur lie for nine months in Burgundian barrels. It has an alcohol content of 14.4%. This Chardonnay is made more in the typical California style, thus it has a full bodied, buttery taste. The citrus flavors are more muted though noticeable. This was my least favorite wine of the evening as I do not care for this style of Chardonnay. Though it is not one of the overly-oaked monstrosities you sometimes encounter, it has too much of a buttery taste for my preferences. Now, there are plenty of people though who do like a more buttery style, so for them, this wine should be very appealing. The 2006 Ramey "Russian River" Chardonnay ($44.00/ $37.40/ $35.20) is sourced from some top notch vineyards, including five different Dutton ranches, Rochioli Vineyards, the Heintz Ranch near Occidental and Green Pastures Vineyard. This wine had a light yellow color and an interesting nose of apple. On the palate, it was a delightfully crisp wine with a nice blend of fruit flavors, including apple and pear. There was a streak of minerality as well. It has a nice, lingering finish and is definitely very appealing. It seems so radically different from the Landmark. A top notch wine from a top notch winery. Well worth the price. We also tasted the 2005 Ramey "Ritchie Vineyards" Chardonnay ($75.00/ $63.75/ $60.00). This is a single vineyard Chardonnay, located in the center of the Russian River appellation. This wine was similar in a number of respects to the other Ramey, except that this wine's aspects were a step above. Its color, nose and taste were all superlative to the other Ramey, though in the same vein, that crisp taste with great fruit and some minerality. It was also more complex, adding a few different flavors, a bit of peach, nut and pineapple. This is certainly an exceptional wine, one to drink and ponder over, to try to assess all of its complexities. The next two wines were Italian, made by the renowned Angelo Gaja. Both of these wines are from the Maremma region of Tuscany. This region was once a marshland but has been transformed into an important wine region. The warm climate favors international grapes such as Cabernet Sauvignon, Cabernet Franc, Merlot and Syrah. There are three wines made under the Ca'marcanda label, and the origin of the label's name is fascinating. Gaja found a vineyard in the Maremma he wished to purchase, but the elderly owners did not wish to sell it. Gaja returned to the vineyard a few years in a row, each time offering more money for the estate. And each time, the owners refused his offer. Gaja's wife told him that he was in Ca'marcanda, which in Italian means "house of endless negotiation." She convinced him to keep trying each year. He did and the owners finally relented, though it cost Gaja a very high price. The 2005 Gaja Ca'marcanda "Promis" ($49.95/ $42.45/ $39.95) is a blend of 55% Merlot, 35% Syrah and 10% Sangiovese. The three grapes are fermented separately and then later blended together. The wine spends 18 months in new and slightly used barriques, followed by several months of bottle aging. It has an alcohol content of 14%. This wine has a medium red color with a prominent dark cherry nose. On the palate, this is a dry and full bodied wine with plenty of dark cherry flavor and a touch of tobacco. It is a smooth wine with mild tannins and a nice, long finish. An easy-drinking wine, though still possessing much complexity, that should appeal to many different tastes. It would definitely be an excellent food wine. The 2005 Gaja Ca'Marcanda "Magari" ($80.00/ $68.00/ $64.00) is a blend of 50% Merlot, 25% Cabernet Sauvignon, and 25% Cabernet Franc. This is like a French Bordeaux. The three grapes are fermented separately and then later blended together. The wine spends 18 months in new and slightly used barriques, followed by six months of bottle aging. The term "Magari" has several meanings, including: "if only," "would that it were true," and "perhaps." This was an excellent wine, very French in style, with good fruit, lots of structure and balance, and a very long finish. A well crafted wine that should age well. My favorite wine of the tasting was the 2005 Chappellet Signature Cabernet Sauvignon ($50.00/ $42.50/ $40.00). I had recently tasted the 2005 Chappellet Mountain Cuvee ($27.99) and very much enjoyed it. So, I was intrigued to taste their higher-end Cabernet. The "Signature" Cabernet has been their flagship wine for more than three decades. It is a blend of 84% Cabernet Sauvignon, 9% Merlot, 5% Petit Verdot and 2% Malbec. This is a powerhouse of a wine. It has a rich, dark red color, almost purple in hue. Its nose is vibrant with dark fruit and spice notes. On the palate, it is full-bodied, muscular and spicy. There are rich flavors of cassis, blueberry and ripe plum combined with plenty of spice and hints of chocolate. A well-integrated wine with a very long and satisfying finish. A superb wine with plenty of complexity and rich flavors. This is everything you could want in a Cabernet. And I think it is a good value for the price. Overall, this was a fine and interesting tasting. Eric, the owner of Salem Wine Imports, certainly arranged for an excellent event. And Bob Z. did a great job of talking about the wines, and entertaining with numerous stories about the wines. Dr. Debs of Good Wine Under $20 has now posted the Round-Up of Wine Blogging Wednesday #46, Rhone Whites. You had to choose a wine using any of the Rhone white varietals, including Bourbolenc, Clairette Blanc, Grenache Blanc, Marsanne, Muscat Blanc a Petits Grains, Picardin, Picpoul, Roussanne, Ugni Blanc, and Viognier. These grapes are often blended together and blends were fine for the theme. And we could choose wines made with Rhone grapes from anywhere in the world. Over forty wine bloggers participated and they tasted many different grape varieties as well as wines from several different coutnries. Dr. Debs took a more unique and interesting way to sum up the results of the tasting. First, she provided a Google map that lists the locations of all of the participating bloggers. You can see that the bloggers came from four different continents, though the majority are from the United States. Such a map could also be designed to indicate where all the wines that were tasted came from. We could then compare how many were European as to how many were from California. Second, she created a TagCloud Review. This is an alphabetical list of descriptors that were used to describe all of the wines in the tasting. The larger and bolder words are those which were the ones most frequently used. This gives an intriguing over view to Rhone whites and the flavors you might expect. I am sure there was a lot of work involved in designing this TagCloud and I find it a fascinating tool. There is finally a list of all of the participants and the wines they chose, with special mention for certain participants. There is also a partial breakdown of the regions where all the wines originated. Dr. Debs certainly raised the bar here for future Round-Ups. Her Round-Up was interesting, unique and informative. She deserves special kudos for all the effort she invested into this Round-Up. You must check out her Round-Up! Happy 117th birthday for Dr. Pepper! Today is the birthday of the original Dr. Pepper factory in Dublin, Texas. Dublin is also known officially as "Dr Pepper" for one week each June during their annual birthday celebration. The factory was established as a Dr. Pepper bottling plant in 1891, just six years after the drink's invention in nearby Waco. The factory is also unique as it creates its Dr. Pepper using Imperial Pure Cane Sugar, the original Dr. Pepper formula. Let us go back to Waco, Texas in 1885. Wade Morrison’s Old Corner Drug Store was a prominent business and popular meeting place. One of their employees, pharmacist Charles Alderton, wanted to invent a drink that tasted the wonderful way the soda fountain smelled. After much experimentation he finally felt he had hit on something different and it quickly became extremely popular. .” Patrons at the drug store agreed. Morrison named this new drink "Dr Pepper" after the father of a girl he had loved back in his home state of Virginia. In 1891, Morrison and Robert Lazenby organized the Artesian Manufacturing and Bottling Company in order to bottle and sell Dr. Pepper and other soft drinks. A Texas businessman, Sam Houston Prim, also enjoyed Dr. Pepper and wanted to sell it in his bottling plant in Dublin, 80 miles to the west of Waco. Dr. Pepper is currently one of the top 3 soft drinks in the U.S. and the No. 1 non-cola. I am a big fan of Dr. Pepper and always have been. I enjoy its unique taste, that melange of flavors that mesh into an intriguing whole. Though it does seem to be a polarizing soda. You seem to either love it or hate it. There seems to be little middleground. I plan on raising a glas of Dr. Pepper to celebrate the anniversary! How about you? Are you a fan of Dr. Pepper? Sometimes that carnivore in you just takes over and you crave meat, lots of it. Succulent, grilled beef, chicken, pork and more. Such a craving came over some friends and I last evening so we decided to dine at the Fire Bull Restaurant, a churrascaria (Brazilian steakhouse) in Peabody. The Firebull is not my favorite churrascaria (that would be the Midwest Grill) but it is still a very good restaurant and well worth visiting. When I am around Peabody, and get the urge, the Firebull is a good option. The Firebull is open for both lunch and dinner. At dinner, the Rodizio, the all-you-can eat BBQ is $23.95. This includes a salad, white rice, fried plantains, feijao tropeiro (a Brazilian dish of beans, bacon, eggs, collard greens, kielbasa), and all the meat you can eat. The meats include items such as garlic beef tips, top sirloin, chicken wrapped in bacon, chicken wings, ribs, pork loin, chicken hearts, lamb, and pork sausage. A few other items are sometimes available as well. If the Firebull had more sides available, like Midwest Grill, I would prefer it more. Though the meat is obviously the center of the rodizio, it is also good to have a variety of interesting side dishes. One thing I wanted to note, as I think it is new at the restaurant, is that you can now bring your own wine, for a corkage fee of $8 per bottle. Though they do sell wine, with some interesting selections from Portugal and Brazil, it is even better that you can bring your own. That is certainly a very good change. Last night, the Rodizio was maybe the best I had ever had there. The meats were cooked perfectly, were hot, juicy and moist. There was not a single meat last evening that I did not enjoy. And the restaurant was really not that busy so it was not an issue of a quick turnaround. The garlic beef, always one of my favorites, was absolutely delicious. The rare top sirloin just melted in my mouth. The pork loin was superb. Just a fantastic spread. Service, as usual, was excellent. They are very accomodating, pleasant and and gracious. I will return again here and do recommend that you try it out as well. Back in March, I started compiling a list of women wine bloggers. That list has grown and grown. There are over 70 women wine bloggers and writers and I am sure there are others out there that are not listed yet. It is great to see so many women contributing to the world of wine. As old blog posts can sometimes be forgotten, I felt it was important to bring my list forward again, especially as the list is continually being updated. I started a discussion on the OpenWine Consortium and that has helped locate additional women wine bloggers and writers. I am still looking for more women to add to the list. There is no end date for the list. It will continue to always been updated with new information. Check it out and maybe you will find a new favorite wine blog. I stopped by The Ginger Pad in Burlington for dinner last night. I noted that they are undergoing some renovation, expanding their restaurant into a small area next to them. They are going to add a Sushi Bar. I don't have any more details on it as of yet, but I am eagerly looking forward to it. Based on what they offer now, I would expect the sushi to be fresh and reasonably priced. I don't even know when it will open. Their website is silent on the expansion. But I will share any new information I find. Beverly Wine & Beer Co. is holding a special inventory reduction sale, with 30% off wines priced $39.99 and above. This is an incredible opportunity to treat yourself to selections that might not normally find their way home. The 30% discount applies to in-stock items only; excludes Champagne and this week's New Arrivals. The sale runs for one week only -- now through June 22nd. 2005 Tyrus Evan Syrah Del Rio Vineyard; Rogue Valley, Oregon (Reg. $44.99, Sale $31.49): Ken Wright, known for his highly-rated, single-vineyard Pinot Noir, introduced a new label in 2003 called Tyrus Evan, producing the "bigger" reds: Claret, Syrah, Malbec and Cabernet Franc. Wine Spectator 90 points: "Soft, supple and distinctly spicy, with a green olive note weaving through the black pepper-accented cherry and blackberry flavors. Drink now through 2012. 585 cases made." 2005 Hartley-Ostini "Hitching Post" Pinot Noir; Santa Maria Valley, California (Reg. $44.99, Sale $31.49): Robert Parker 90 points: "My favorite wine of this group is the 2005 Pinot Noir Santa Maria, which possesses the sweetness of Pinot along with an outstanding fragrance of red currants, cherries, loamy soil, fresh mushrooms, dried herbs, and earth. Medium to full-bodied with supple tannin, good acidity, and a round, long finish, it is a classic Santa Maria Pinot Noir that should drink nicely for 7-8 years." 2006 Eric Kent Chardonnay Sonoma Coast; Sonoma, California (Reg. $42.99, Sale $30.09): Wine Spectator 92 points in 2005: "Floral, peach, honeysuckle and melon aromas are distinctive, and the fruit is pure on the palate, with a hint of spice. Ends with an elegant, graceful aftertaste. Drink now through 2010. 225 cases made." 2004 Ridge Monte Bello; Santa Cruz Mountains. Central Coast, California (Reg. $174.99, Sale $122.49): The Monte Bello is the wine that introduced Ridge to the world. Critics consistently offer high praise for this Bordeaux-style blend, and the early tastings of the 2004 indicate the same high level of quality and aging potential. It is not uncommon for this single vineyard gem to mature and improve for 15 to 20 years. Wine Spectator 92-94 points: "A mix of elegance and power, with deep, dark, concentrated cherry cassis, spicebox and cedar notes. Chewy, rustic nuances of herb, eucalyptus, leather and sage flavors fill out on the finish. Cabernet Sauvignon, Merlot, Petit Verdot and Cabernet Franc." 2003 Robert Mondavi Reserve Cabernet Sauvignon; Napa, California ($124.99, Reg. $87.49): Robert Parker 94 points: "The rich and intense 2003 Cabernet Sauvignon Reserve has a saturated ruby/purple color and is sweet and dark, with a complex nose of creme de cassis, blackberry, subtle oak, and smoke. It is medium to full-bodied and seems richer, fuller, and more intense than the 2004, but again reminds me of a St.-Julien made in Napa." 2005 Eric Kent Syrah "Kalen's Big Boy Blend"; Sonoma, California (Reg. $42.99, Sale $30.09): California Syrah may well be my favorite red -- it strikes a balance between the fruit bomb style in Australia and the earthy French version for a perfect food wine. Every few years the magazines predict great things for Syrah, but for now it remains a bit of a "wine geek" varietal, a wine with great cellaring potential that can still be enjoyed early. The Eric Kent wines are truly boutique selections, with very small production and artistic labels. Handpicked Selection: "Inky dark in the glass, the nose offers up rich, black fruit, black and white pepper, a faint tease of eucalyptus and fertile earth tones. Then a sip unleashes dark cherry, pomegranate, black licorice and cola nut, all lovingly embraced by fine, sweet tannins. While a tad of patience will be handsomely rewarded, if you decide to open one sooner rather than later, a brisk decanting and a couple of hours on the table will enhance it’s youthful charms. 175 cases made." 2003 Chateau Smith Haut Lafitte; Pessac Leognan, Bordeaux, France (Reg. $79.99, Sale $55.99): Wine Spectator 93 points, Top 100 in 2006 #58: "Loads of blackberry and licorice with hints of meat and smoked oak. Full-bodied, with velvety tannins and lots of very ripe and exotic fruit. Very exotic and wild. Rich finish. Best after 2009." Robert Parker 92 points: "The opulent, accessible 2003 offers a dense plum/ruby-tinged color and a big, sweet bouquet of creme de cassis, smoked herbs, lead pencil, and subtle wood. It is a deep, fleshy, medium to full-bodied offering with low acidity, a plump, opulent texture, and a heady finish. Enjoy this beauty over the next 15+ years." 2003 Chateau Giscours; Margaux, Bordeaux, France (Reg. $74.99, Sale $52.49): Wine Spectator 91 points: "Aromas of blackberry, black olives and licorice. Medium- to full-bodied, with velvety tannins and a fruity finish. Refined and nicely done. Best after 2010." Robert Parker 90 points: "Giscours should be taken seriously by consumers as the quality has been ratcheted up over the last 7-8 years. The deep ruby/purple-hued 2003 offers complex, evolved aromatics of wood smoke, chocolate, charcoal, black cherry jam, and cassis. Lush, medium to full-bodied, and broad, with low acidity, copious glycerin, and a layered, persistent finish (it lasts for 40+ seconds), this beauty can be drunk now or cellared for 15 years." 2005 Finca Torremilanos "Cyclo"; Ribera del Duero, Spain (Reg. $49.99, Sale $34.99): Robert Parker 94 points: "The 2005 Cyclo is 100% Tempranillo sourced from two vineyards, one with 85-year-old vines and the other with 150-year-old vines. The grapes were fermented with native yeasts and the wine spent 18 months in new barriques. Purple/black in color, the wine has a superb perfume of wood smoke, toast, vanilla, floral notes, mineral, blackberry, and licorice. Sumptuous on the palate, the wine is large-scaled, powerful, ripe, and structured. Give it 5-7 years in the cellar for additional complexity to emerge. It will drink well through 2030." 2001 Elio Altare Barolo; La Morra, Piedmont, Italy (Reg. $69.99, Sale $48.99): Wine Spectator 92 points: "Loads of fresh blackberry and cherry aromas to this young wine. Full-bodied, with silky tannins and a caressing mouthfeel. Long finish. This is elegant and refined for a young Barolo. Best after 2007. 1,000 cases made." Robert Parker 91 points: "I have tasted nearly every vintage of Elio Altare’s Barolo normale back to 1982 and have seldom been disappointed. The dark-ruby colored 2001 displays a very beautiful and delicately spiced nose, along with flavors of small red fruits and licorice. Offering excellent follow-through as well as length on the palate, it is a Barolo of much harmony and overall balance that comes across as quite classic. Anticipated maturity: 2011-2019." Dow's 20 Year Old Tawny Port NV; Portugal (Reg. $57.99, Sale $40.59): Wine Enthusiast 91 points: "Soft in texture yet mouthcoating in its intensity, this is a honeyed, nutty wine filled with dried fruit, toffee and almond butter aromas and flavors. Like all tawnies, it won’t improve with bottle age, so drink this while your young vintage Ports hog the cellar space." 2006 Marquis Philips Shiraz 9; McLaren Vale, Australia (Reg. $44.99, Sale $31.49): Robert Parker 92-95 points: "The 2006 Shiraz 9 was tasted from a barrel sample. It has been barrel-fermented in new French and American oak barriques and hogsheads where it has been aging for 14 months (with another 2 months to go prior to bottling). It delivers an alluring bouquet of pain grille, smoke, mocha, espresso, and blue fruits. This is followed by a full-bodied, personality-filled Shiraz with blueberry, blackberry liqueur, licorice, and a hint of chocolate emerging on the palate. Opulent, sweet, and lengthy, it will evolve for several years but can be enjoyed now and over the next 12-15 years." 2006 Glaetzer "Amon Ra"; Barossa Valley, Australia ($99.99, Sale $69.99): Robert Parker 97-100 points: "Amon-Ra has become one of Australia’s icon wines. Made from 100% Shiraz sourced from vineyards ranging in age from 80-120 years and with microscopic yields of 0.5 tons per acre, the 2006 Amon-Ra was aged for 15 months in new French and American oak. The wine is a thick, glass-coating, purple/black in color. The aromas cover a wide range of scents including smoke, vanilla, pepper, Asian spices, coconut, espresso, blueberry, and chocolate. Thick, rich, layered, and complete, this monumental wine offers extraordinary intensity and length. It requires 10-15 years to fully evolve and should easily last through 2040." 2005 Concha Y Toro Cabernet Sauvignon "Don Melchor"; Maipo, Chile (Reg. $74.99, Sale $52.49): Wine Spectator 96 points "Highly Recommended": "Still very tight, but the tannins that lead the way now are sleek and refined, and should easily meld into the huge core of roasted chestnut, black currant paste, warm fig and tar. Has a long, coffee- and loam-tinged finish. Best from 2009 through 2019." Beverly Wine & Beer Co.
Piedmont Wine Tasting at Lower Falls Wine Co.
Are Spanish Diners Being Poisoned?